MiJET Parts Basket - Flat Top Units - 8"
MiJET Parts Basket, stainless steel fine mesh. double handles For use with MiJET Flat Top 8" Model..
MiJET Drum Dolly, 20 gallon, 4 wheels for 12" MiJET models. 18.38" OD x 6.63" Raises MiJET up by 4..
MiJET 3.5 gallon Solvent Dip Container, with fusible link for fire damping. 15.0" x 12.0"..
MiJET Dolly - Standalone - 8"
MiJET Non-Metallic Basket Liner. For use inside the stainless steel basket of all 12" diameter model..
MiJET Non-Metallic Basket Liner. For use inside the stainless steel basket of all 8" diameter models..
MiJET Parts Basket, Angle Top Units - 8"
MiJET Parts Basket, fine mesh, single handle. For use with MiJET Angled Model. P/N 14-8F..
Low Noise Air Nozzle by Silvent is the most commonly chosen stainless steel Laval nozzle. Mounted on..
MiJET Low Noise Air Nozzle by Silvent with rubber tip on a stainless steel Laval nozzle. 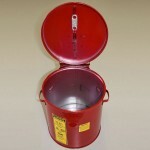 Mounted ont..
MiJET 2 gallon Solvent Dip Container, with fusible link for fire damping. 12.5" x 11"..